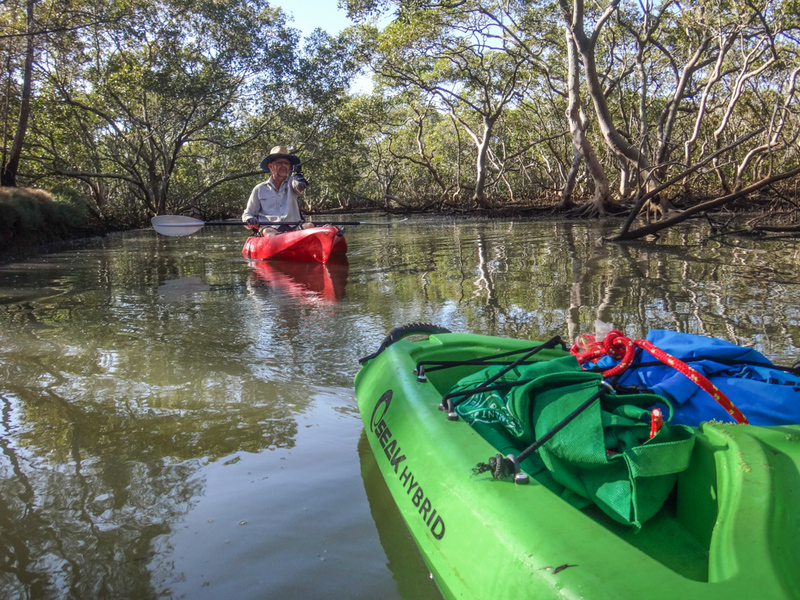 Drifting over the water in the shade of mangroves is a perfect way to escape the heat of a blistering summer day. 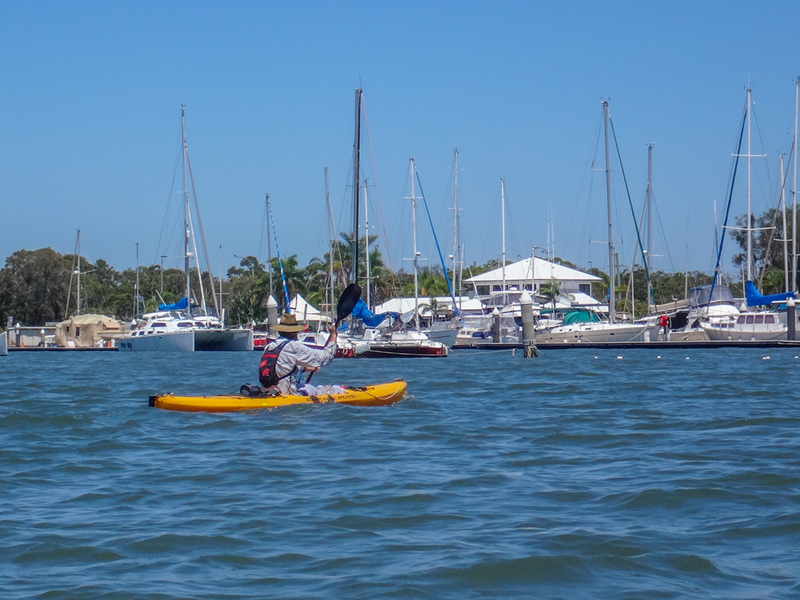 We started our adventure at the mouth of Cabbage Tree Creek near the Shorncliffe marina. 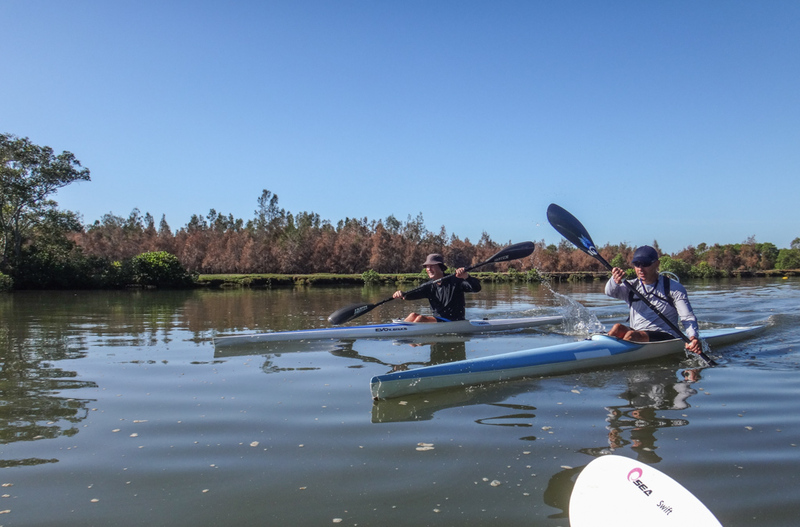 The bureau had forecast temperatures in the high thirties (around 100F) so we decided a morning on the water would be more comfortable than a ride on the bikes. 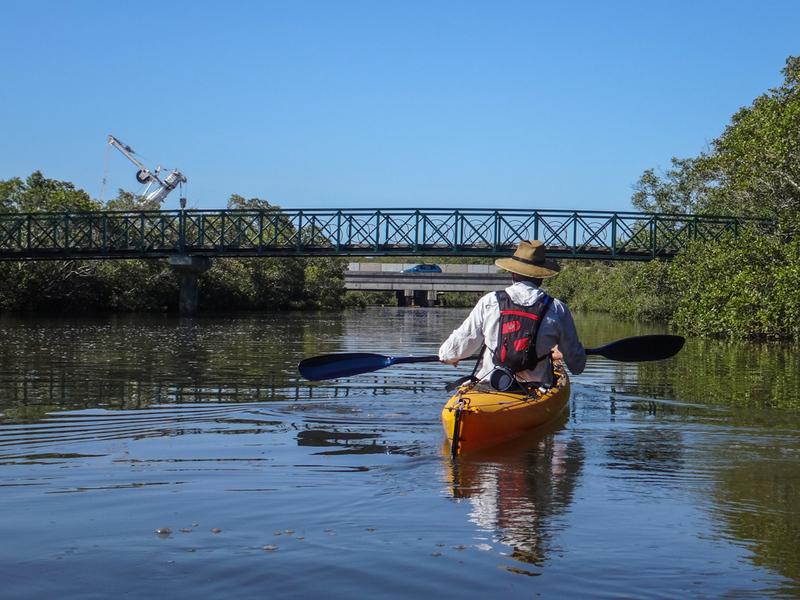 We set off up Nundah Creek on a rising tide. The incoming current gently drew us upstream. 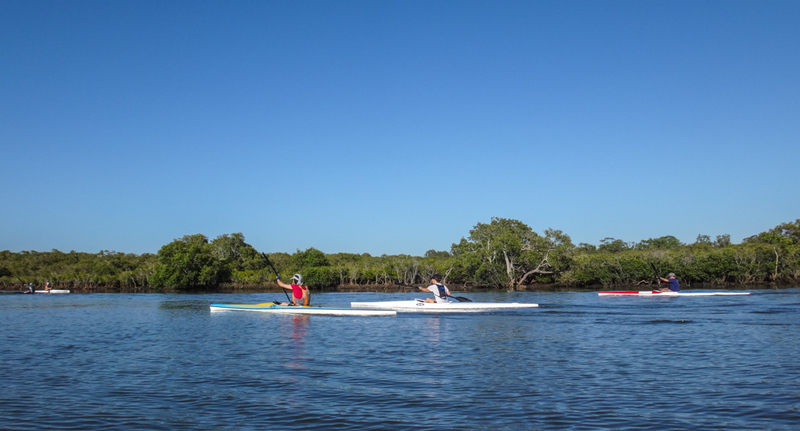 While we paddled along at a leisurely rate, serious looking kayakers powered past us in their sleek boats. 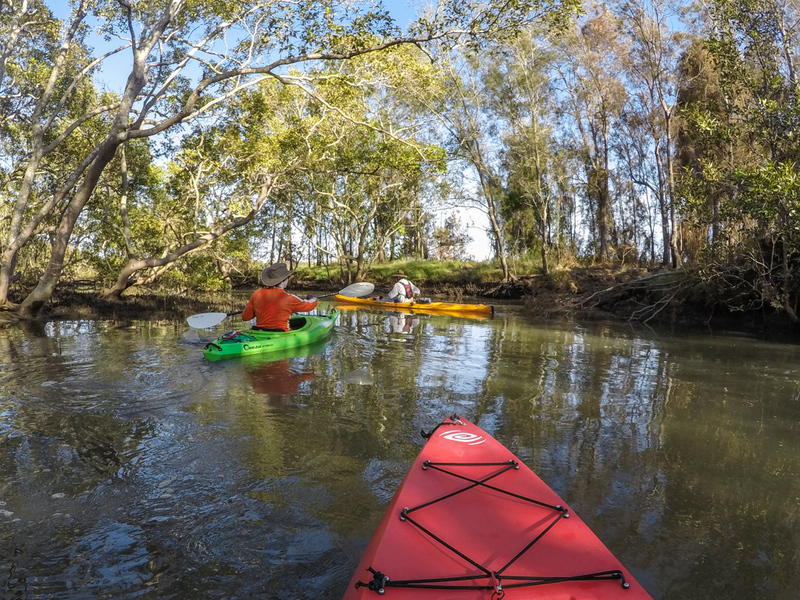 Nundah Creek meanders through the Boondall Wetlands for several kilometres. It’s surrounded on either side by mangroves. 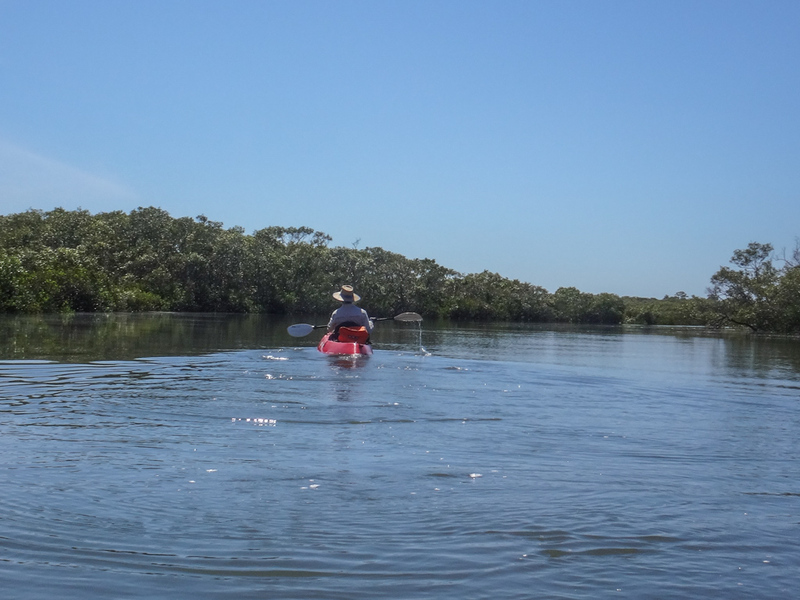 From the water, it feels remote and unspoilt. Rather than just power up the creek like everyone else, this morning we decided to take a detour down a small tributary. The banks closed in on either side. Branches hung low over the water. 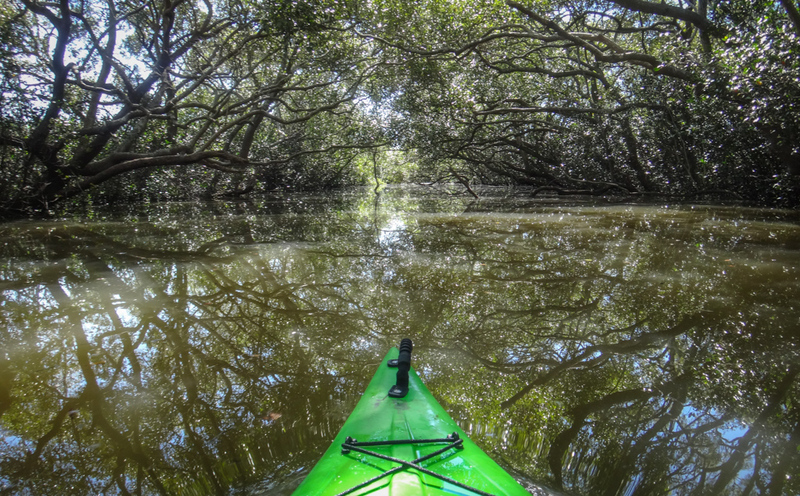 We had to keep our paddles close by our side to avoid getting them caught in the trees. We had no firm plan. We just wanted to see where we’d end up. Eventually, the creek became too narrow to navigate, so we returned to the main watercourse to continue our trip upstream. It was like a busy main road for boats. People zipped by in twos and threes, eager to keep up the frantic pace. “Hey! That looks like fun. 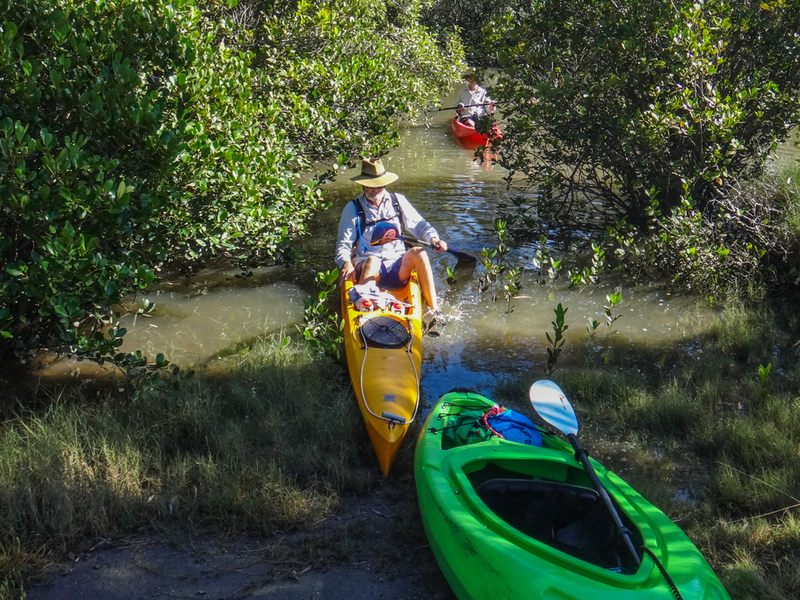 Is it easy to paddle?” I yelled out. “Yeah it’s easy!” he replied. 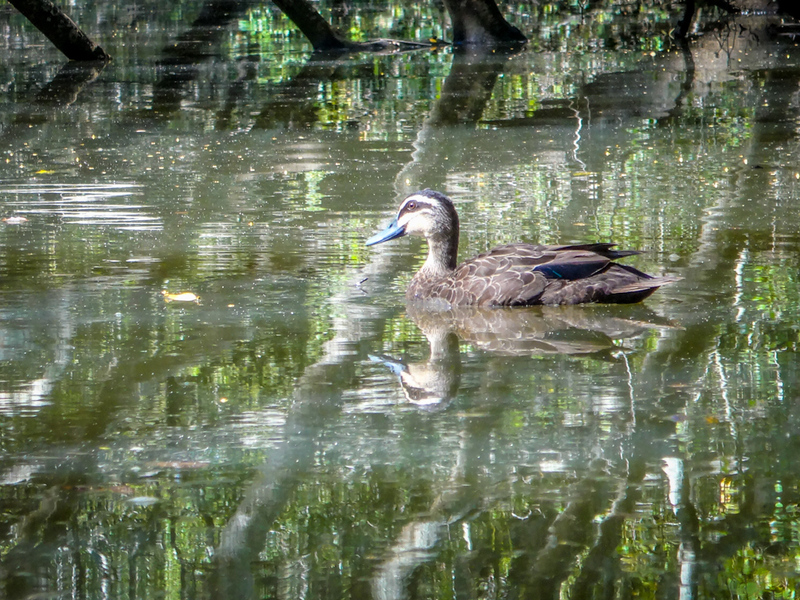 The Boondall Wetlands are a haven for many bird species. 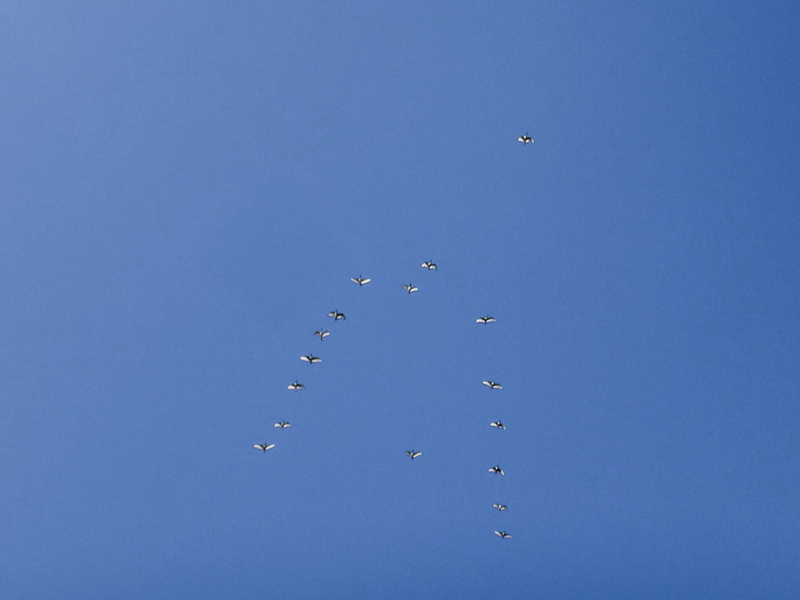 A vee-shaped flock passed overhead while a variety of different birds looked down curiously at us. 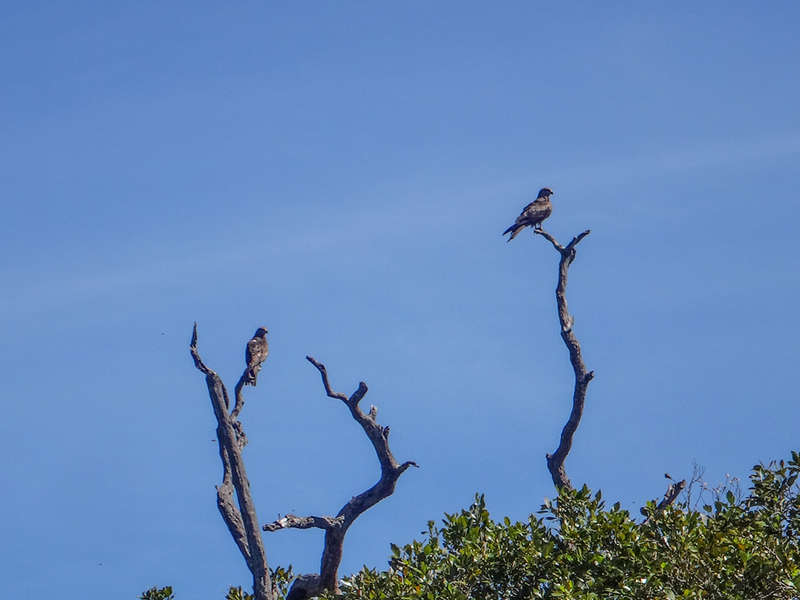 A pair of Whistling Kites wondered if we’d make a good meal. 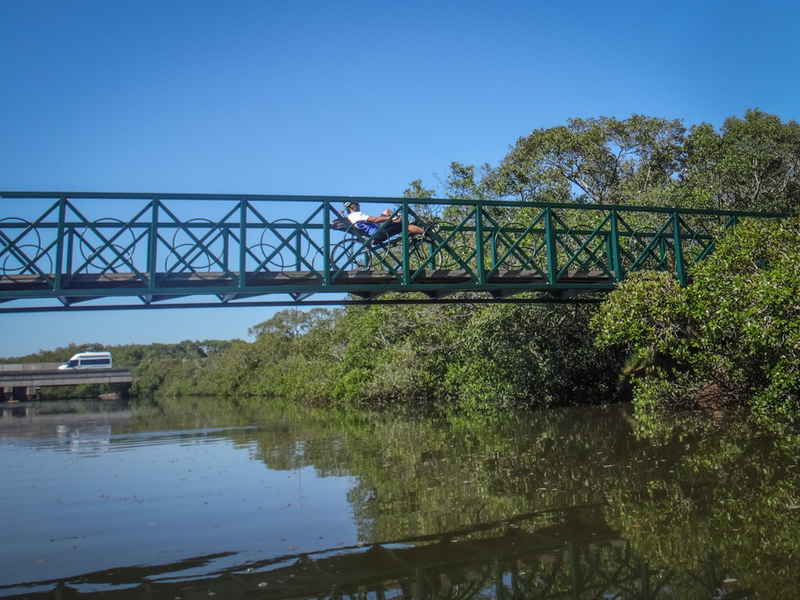 Eventually, we reached one of the bridges of the Moreton Bay Cycleway. My friend Dirk just happened to pass over on his recumbent bike as we slid under it. 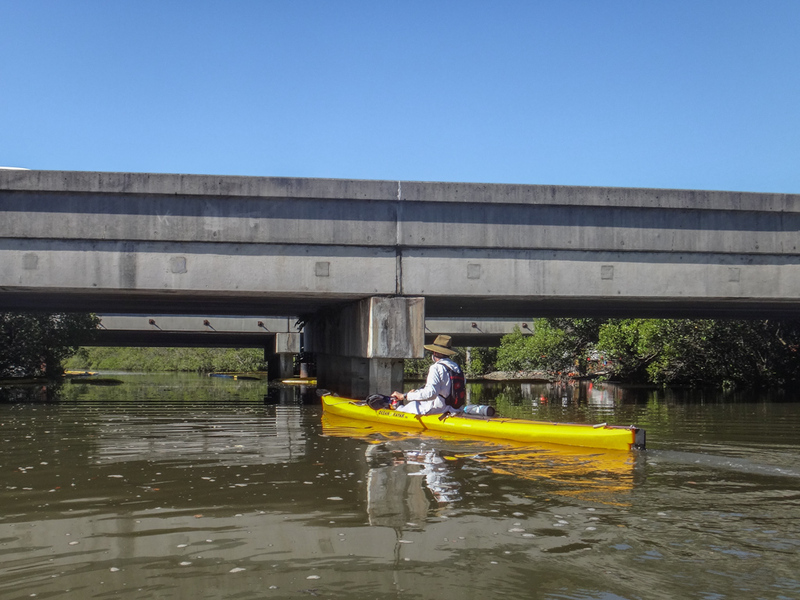 Under the cycleway bridge, under the Gateway Motorway… we kept going upstream. Calum has been this way before. 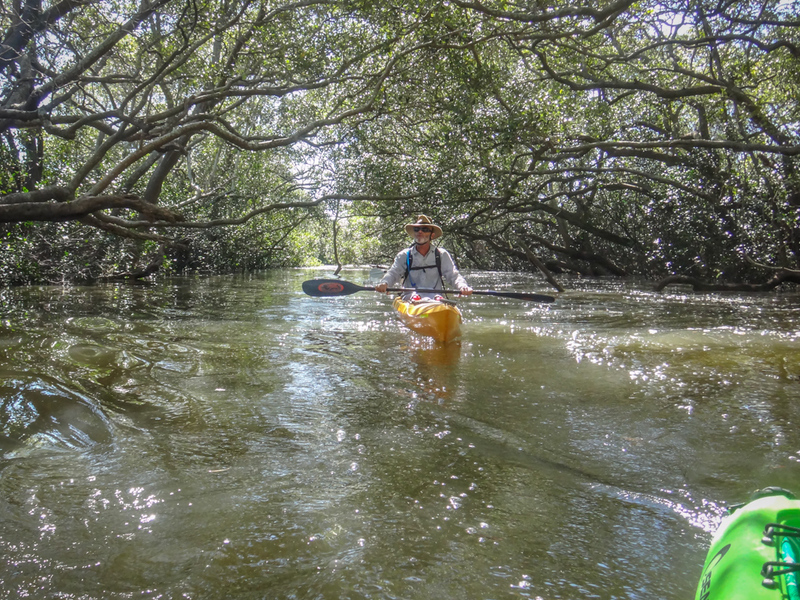 He pointed out a hidden beach between the mangroves, one of the few places we could come ashore. We decided to hop out here for a few minutes and have a quick snack. The creek narrowed as we followed it upstream. 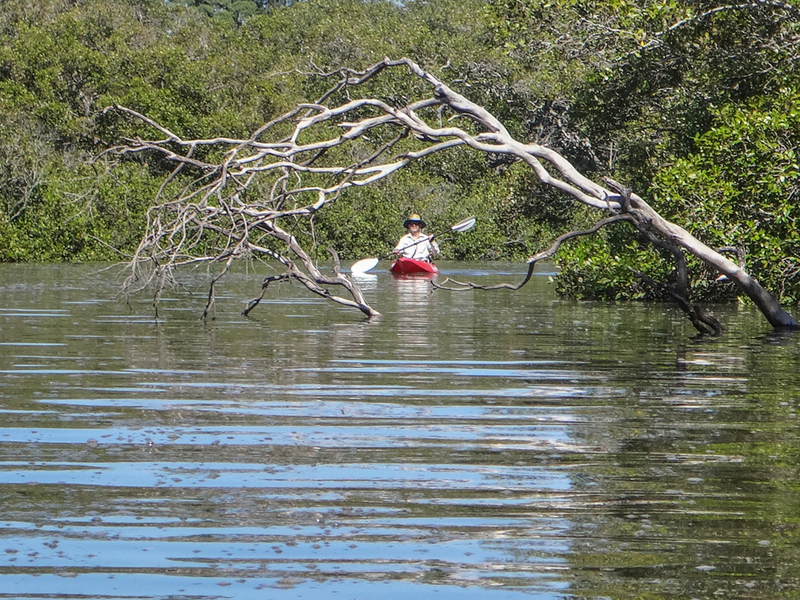 Mangrove branches arched over us. We drifted silently through the water. I startled a duck that was sitting on a branch. It fluttered away into the water. We probably could have followed the creek for another hour, but the tide was about to turn. Now would be a good time to point the boats downstream. Slowly we drifted back the way we had come earlier in the day. 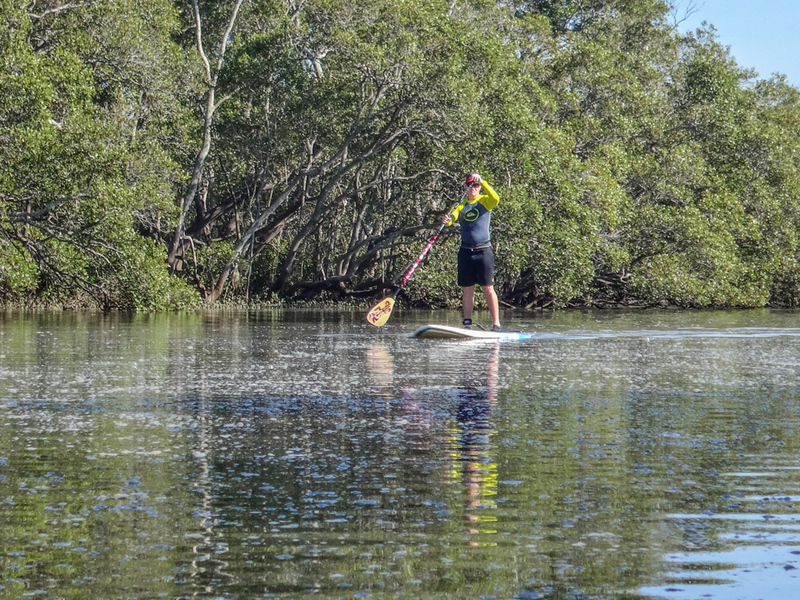 The enjoyable thing about paddling is that if you chose the right tides, you can “ride” downhill all day. 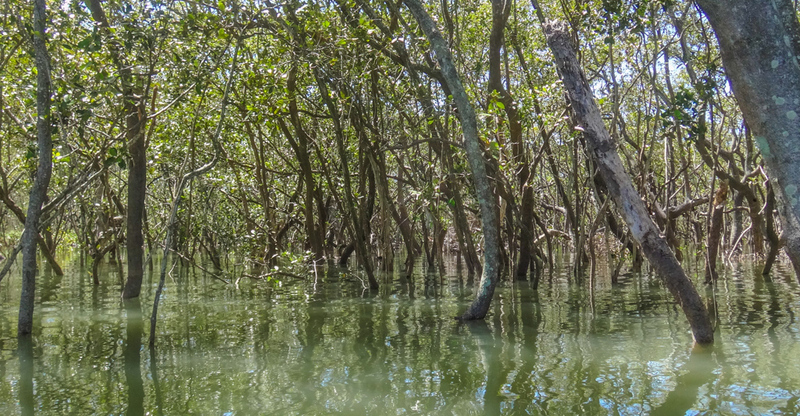 Myriads of mangrove trunks poked out of the water. 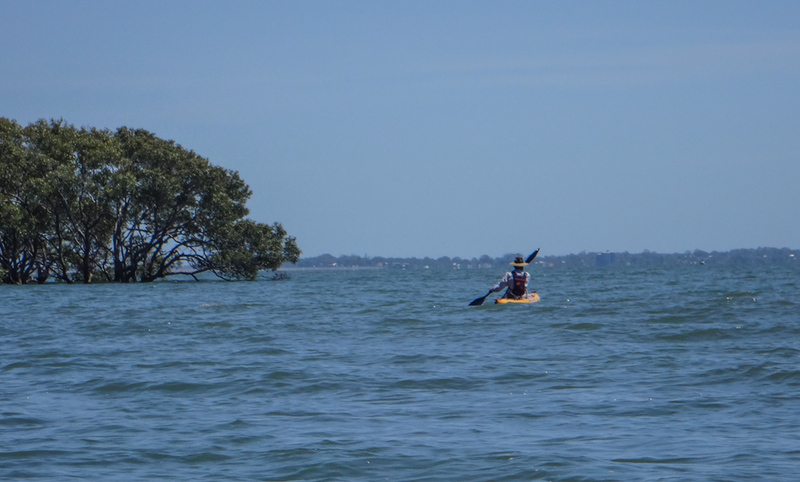 These amazing trees grow in salt water and don’t seem to mind having their roots submerged. 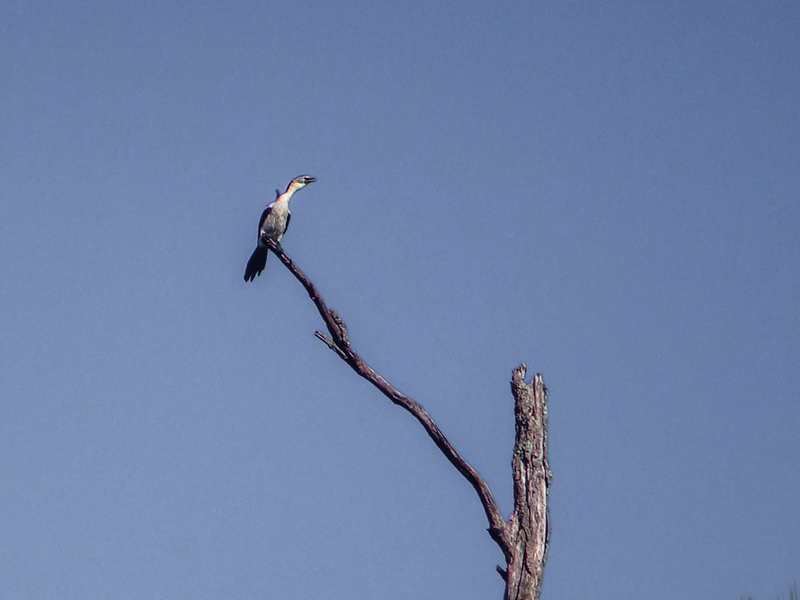 They’re an important breeding ground for fish and birds. Prior to paddling through them I always thought of them as dirty muddy unpleasant places, but they’re actually quite beautiful. 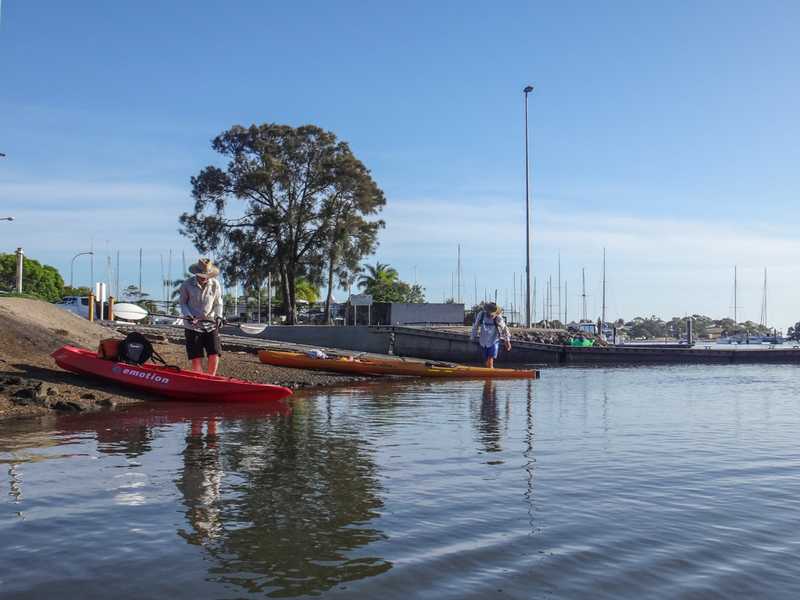 There is a “portage” point on Nundah Creek which allows you to carry your boat along a path to Nudgee Creek. 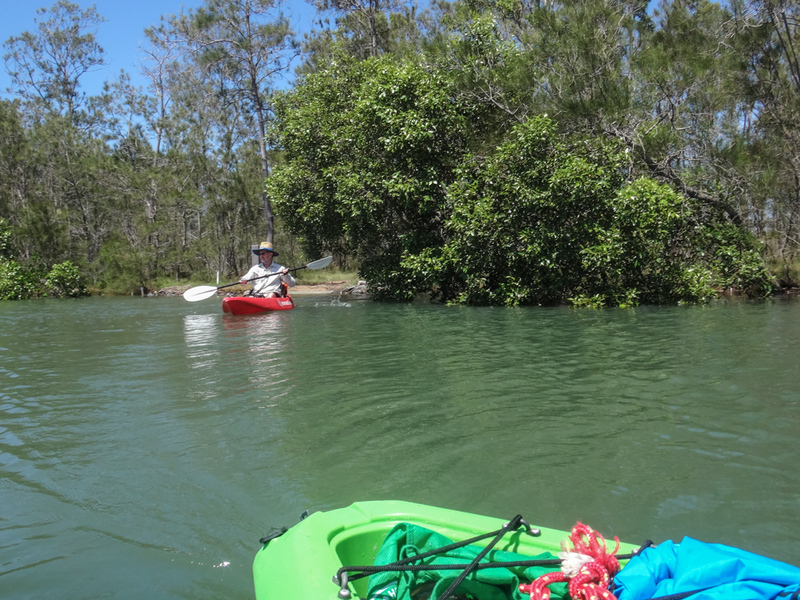 By doing a bit of legwork it’s then possible to explore two creeks at once and do a “loop”. Today the tide was so high that it submerged the path. 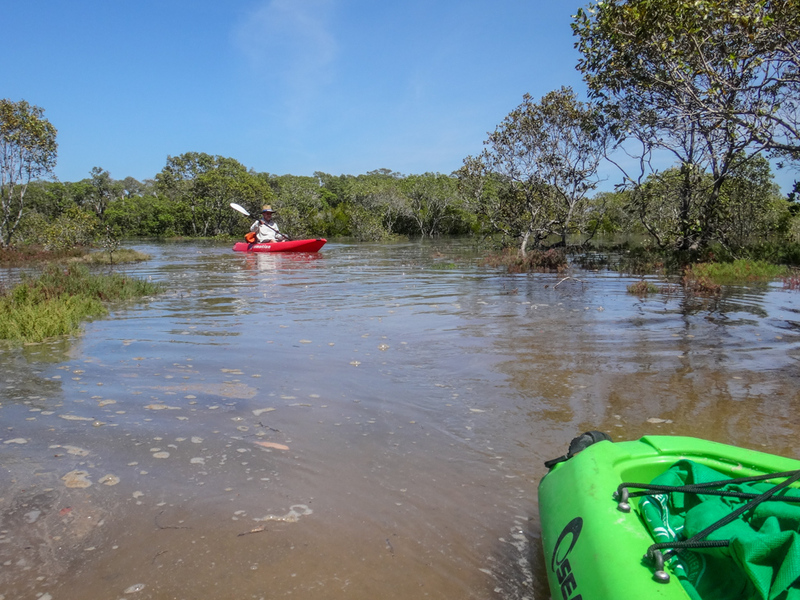 We were able to drift most of the way along the path in about 15cm of water, which meant we didn’t have to carry the kayaks so far. 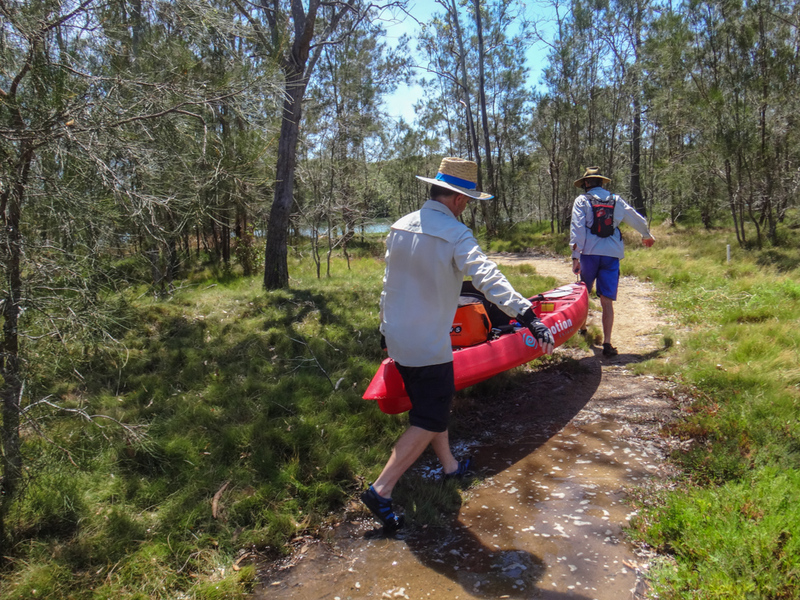 Thanks to the high water we only had to carry our boats about twenty metres to Nudgee Creek. As we approached the creek mouth the wind picked up. The water grew rougher. For the first time today we actually had to work hard to make progress. 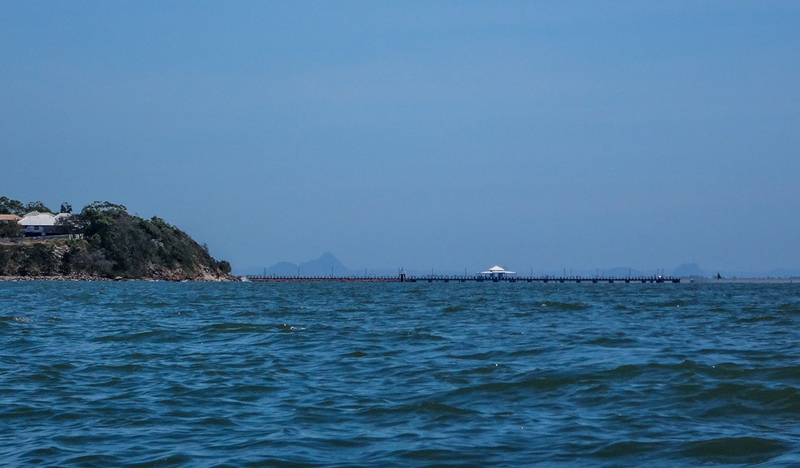 In the distance, the Glasshouse Mountains raised their heads above the Shorncliffe pier. I hadn’t seen them from this angle before. 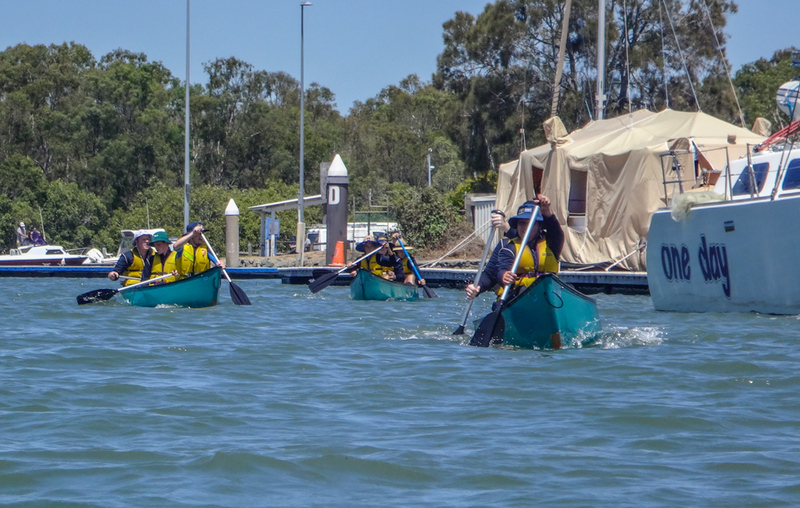 Back at Cabbage Tree Creek, we paddled past the marina. Some kids in canoes sang as they paddled past us. 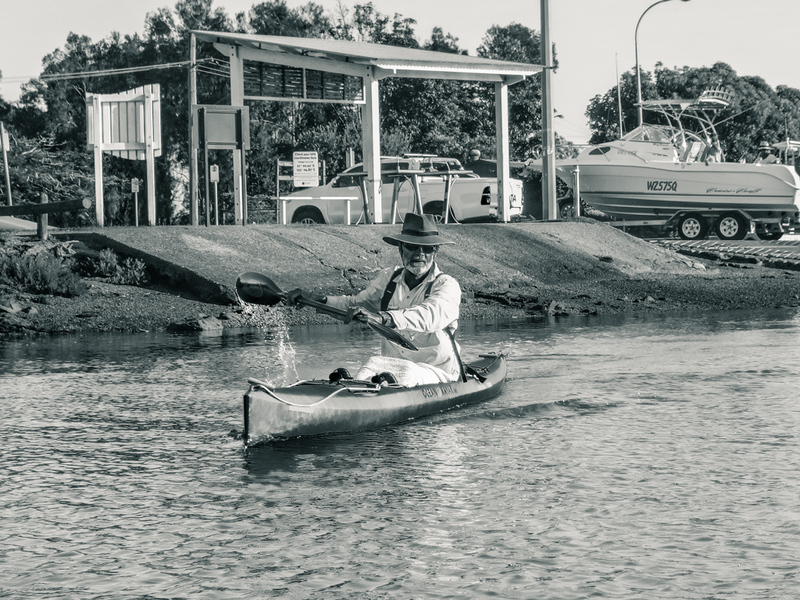 You meet a lot of happy people on the water! Here’s Russel’s quick video of our trip. Today we travelled about 15km in just over four hours. It was a leisurely pace – perfect for a hot day. Thanks, Calum and Russel, for another fun adventure!